I have always loved planners. Way back in my hellish days at Erskine, I had a class with some forgettable professor who mentioned briefly that using a DayRunner was only for people who could be dedicated to using it properly. I was insulted that his tone indicated that no one in the lecture had that level of dedication and spurred to have the need to prove him wrong. A couple of years prior to that I had briefly been an exchange student to Belgium and one of the things assigned to me at school was my first student planner. I loved it and used it even after I returned home for the rest of that school year. During the time before I was married, when I trained and exercised horses and farm-sat locally, I relied on a DayRunner to keep me on track. I never needed all the features in a DayRunner, but I enjoyed having a planner to map out my day and keep up with my clients and expenses. After parenthood I needed something smaller and moved into a Sanrio Hello Kitty planner. It was just a little A6 size 3 ring binder but it kept me on track and it amused me with its bright colors and illustrations. 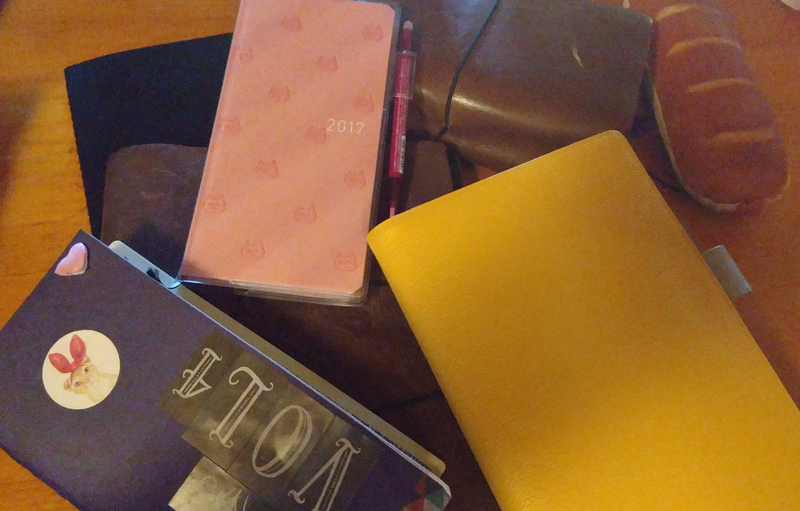 At some point I decided I needed to be a grown up and moved into a Filofax which I adored… until the elastic broke and it started to fall apart. Then I moved into a Franklin Covey that also fell apart on me (curse you magnetic closures!). Somewhere along the way I used a couple different Moleskines for farm records and even used spiral notebooks at one point. A few years ago I ran across Midori Travelers Notebooks and really felt like this was a thing I needed in my life. It took another year or so to convince myself to purchase one and when I did I opted for a cheaper version just in case it didn’t work out. Long story short, I love TNs. My brother is also a fan and we spent a recent Thanksgiving making various versions of notebooks and inserts. I was in love with the Tomoe River paper that Midori uses in their inserts so instead of buying the Midori inserts I bought a ream of TRP and made my own. Aren’t I clever? I use many of these inserts in a year as I use my standard TN for art journalling and mind-dump journalling. I use my larger B5 TN for all my farm and horse records. However they still did not fulfill my planner needs. I got my first Hobonichi last year and because I was nervous about ordering something too expensive that I would not like, I opted for one of the cheaper iterations… the A6 English Planner with one of the simpler pink covers. I know most people who use the Hobonichi are quite talented artists and do these beautiful watercolors and stamped themes. I used my little A6 to simply record the things that were going on and to keep me on schedule… with the occasional sticker or washi tape thrown in for kawaii effect. So for my birthday, J surprised me with the bigger A5 Cousin with the ohhh so lovely Sunflower leather cover. I have been in the Cousin since the first of the year and with it I have found complete planner peace. I still use it primarily as a planner, but also as a way to record the highlights of the day and an expense tracker. I have succumbed to the sticker frenzy and while my dailies will never be artist quality, they make me happy to flip back through and that’s winning right? He also gave me a Hobonichi Weeks in the Meow Meow cover. It’s a week on one page with notes on the facing page. I use it to record farm expenses and important animal information. I think there is a lot to be said for liking the esthetic of a planner/journal and the feel of the paper and the look of the covers really feels all of my needs. My family knows that my planner has nearly holy book level status as I use it to keep up with all the little minutiae that used to clutter up my brain instead. It is, in effect, my external memory storage device of choice!